Did you know that in Japan, most schools don’t employ janitors? It’s true! Rather than have someone clean up after them, students and teachers take 15 minutes to scrub the school themselves each day. The practice is called “souji,” and educators say it helps kids learn about responsibility.By thinking of responsibility as “helping each other,” chores feel less like drudgery and more like teamwork. And when it comes to dinner, kids who help plan and cook their meals feel more invested in them. They’re more likely to eat what’s on their plates, and less likely to take future dinners for granted.Below, we offer tips on making responsibility fun, along with games, recipes that children can make themselves, and of course, great conversation starters. Set Age Appropriate Tasks: To avoid kids getting overwhelmed or discouraged, it’s important for them to feel like they’re actually helping. Have younger children empty the dishwasher or set the table. Older kids can plan and cook one meal a week (more on that below!). Establish Habits: Creating a routine helps kids weave chores into their daily lives, which means less of a battle each time something needs to be done. If kids know that they’re expected to dry the dishes or water the plants, responsibility becomes a given. Use a Chore Wheel: Chore wheels are a great way to establish routine without creating boredom. Spin the wheel to assign different chores to family members. For ideas on making one, check out our chore wheel activity below. Make it About Helping Others: Putting the emphasis on helping others can make chores more exciting. For example, during a recent snowstorm, our team member Lynn suggested that her boys sneak into the yard of their older neighbors and shovel their walk for them. The boys had a blast and the neighbors were thrilled. Lynn also gives her boys the responsibility of planning one meal per week. She says this takes some of the load off herself and her husband, and leads to the family trying new foods. Read more about Lynn’s approach to dinner in her Family Blog post. To encourage responsibility in the kitchen, have your kids browse through simple recipes and try their hands at making a meal. Below, we’ve selected a few possibilities from ChopChop magazine, a publication devoted to nutritious, inexpensive meals. Have your kids mix and match to create their own menu! Who said responsibility has to be tedious? Use these games to make responsibility fun. Choose a food on your plate and count how many steps were involved in getting it to your table. For example, “rewinding” your glass of milk’s journey might look like this: table, kitchen, grocery store, truck, distribution site, really big truck, farm, cow. If someone gets stuck, go around and see if anyone can think of more steps. How far back you can go? 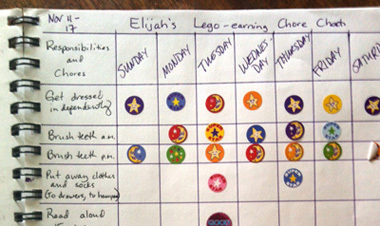 Before or after dinner, gather up some construction paper, markers and tape, and make a chore chart with your family. Check out this excellent chore chart Pinterest board for creative ideas on how to make one. Here are a few fun conversation starters to get your family talking about responsibility. What is one thing you did today that helped other people? What are three things you have to do every day, whether you like it or not? What is one thing you enjoy being responsible for? What are some things you count on other people to do for you? What would happen if they stopped doing it? When people grow up, they are almost always responsible for something. What do you want to be responsible for when you grow up? In the Spiderman series, Uncle Ben says, “With great power comes great responsibility.” What power do you have? What great responsibility comes with it? Can you think of a time when you were responsible for doing something and didn’t do it? What happened? How did the other person feel and how did you feel? In the movie Jurassic Park, scientists decide to bring back dinosaurs, but aren’t able to control them. What is the film saying about society’s responsibility when it comes to scientific discoveries? Do you agree? Former First Lady and human rights advocate Eleanor Roosevelt once said, “In the long run, we shape our lives, and we shape ourselves…The choices we make are ultimately our own responsibility.” What three choices have you made in the last year that have shaped who you are and who you will be? 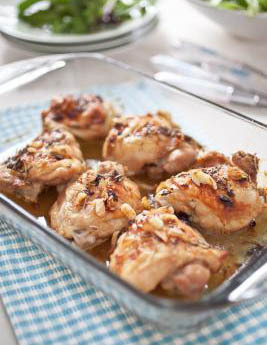 For even more recipes, activity tips and conversation ideas, visit The Family Dinner Project. You can read our Family Blog for ideas and inspiration, get advice and tips from family therapist Dr. Anne Fishel, and find new ways to have dinnertime fun with your family. Happy food, fun and conversation!